My friend, Mary Constant, is an incredible cook, and the co-owner of Constant Diamond Mountain Winery. 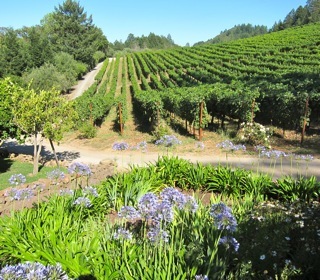 She and her husband, Fred, were our hosts earlier this summer, when Larry and I visited their lovely home amidst its surrounding vineyards. We actually had our own house, a vintage 1890’s farm-house, where Fred and Mary lived for 8 years while they were building their gorgeous home on top of Diamond Mountain. 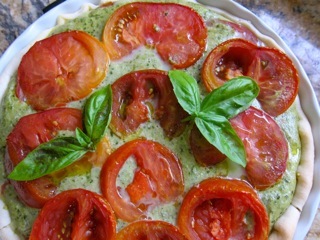 When Mary posted this recipe for Heirloom Tomato Tart on her blog, I knew I would be making it. It is a perfect summer post with all the lovely tomatoes available to most of us this time of year. I think it might be equally wonderful with a thawed puff pastry crust, but that is another post. Always one to play with a recipe, I omitted the tarragon and cut back on the mozzarella. Not a fan of crust-making, I used a room temperature single crust from the deli counter of my local supermarket. I decided to use my quiche dish and also fewer tomatoes as the tart seemed too big with the 3.5 pounds of tomatoes. The tart seemed to come together better for me making only two layers of tomatoes and two of the cheese-egg-basil mixture, instead of the three layers Mary suggests. TIP: place your tart or quiche pan on a sheet pan to catch overflowing juices. Meanwhile, let’s all send vibes to Mary to make her blog Current Vintage more of a regular feature. 1. Preset oven to 375 degrees. 2. Press pie crust into a quiche dish. Cover crust with buttered parchment paper, buttered side down, and top with beans or other pie weights. 3. Bake pie crust for 15 minutes. Remove from oven, save pie weights and discard the parchment paper. Bake, uncovered, for another 5 minutes. 4. Cut the tomatoes into slices, 1/2 inch thick. Using your fingers, remove some of the seeds and juicy pulp. Sprinkle with sea salt and allow to drain in a colander (over a bowl) for 30 minutes. Blot dry. 6. Take the baked pie shell and begin to assemble the tart, first with a layer of half the processed mixture. 7. Next, do a generous layer of half the sliced tomatoes. Spread the other half of the cheese mixture and end with the other half of the tomatoes. Drizzle with olive oil. 8. Bake 35-40 minutes. Allow tart to “rest” for 10 minutes before serving with a garnish of fresh basil. Fausto harvested a bunch of basil at Mission Hills Nursery yesterday, I may be baking this over the weekend. Served with a chilled glass of Pinot out on the balcony watching the sunset, I can already taste it. Enjoy – I might bake the crust without the parchment paper next time, using only pie weights, just to really crisp up and brown the crust. I remember admiring Mary’s recipe, and I like what you have done with it! Always love pizza. I love pizza. What a gorgeous gorgeous tart! Thank you, Steve, next time I will load on more tomatoes – as Mary suggests – and amp up the basil even more.